Interior minister Eli Yishai has requested the government release 12 Jewish security prisoners in light of the Gilad Shalit deal. 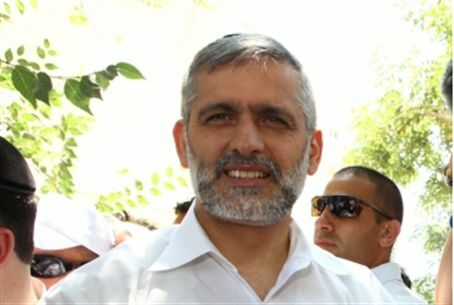 Interior Minister Eli Yishai (Shas) is advocating the release of 12 Jewish security prisoners convicted of "terrorism related activities," Arutz Sheva learned. Before the cabinet vote on Tuesday to approve the release of 1,027 terrorists for kidnapped soldier Gilad Shalit, Shmuel Medad presented Yishai with a list of Jewish security prisoners currently held in Israeli prison and asked him to request their release. The list of Jewish security prisoners reportedly included Ami Popper, Shlomo Dvir, and Ofer Gamliel, among others. It is not presently clear if the petition, which was referred to the Justice Ministry after Yishai presented it, will be honored. Medad told Arutz Sheva, "We are against this disastrous transaction to release hundreds and hundreds of murderous terrorists, but if this is to be approved by the Cabinet, they can make this one small gesture for 12 Jewish families whose loved ones have been imprisoned for years in an Israeli prison." Arutz Sheva learned Yishai's initiative is supported by ministers Daniel Hershkowitz, Moshe Kahlon and Yuli Edelstein. Hershkowitz, one of the move's supporters, said "without justifying the actions of the Jewish security prisoners, the deal we were going to vote on now [the Shalit deal - ed.] is one of the reasons their actions were taken in the first place. We have to include the pardon of Jewish security prisoners in the equation. Israel may be able to swallow the bitter pill of this deal if we sweeten it."